For the second year in a row, state lawmakers are pursuing legislation to ban the use of the death penalty in Washington. As written, the bill—which was requested by state Attorney General Bob Ferguson and has bipartisan support—would prevent local prosecutors from seeking the death penalty in first-degree murder cases and instead mandate the use of life sentence without parole. The Senate bill got a hearing in the Senate Committee on Law and Justice on Monday, Jan. 22. A different version of the bill was introduced in the Senate during last year’s legislative session, but did not make it out of committee. In the state House, Rep. Tina Orwall, D–Des Moines is sponsoring an identical bill that was also introduced last year but stalled. King County Prosecutor Dan Satterberg, who joined Ferguson in speaking to the merits of the Senate bill at the beginning of the hearing, argued that death penalty cases are costly for local governments, are often repealed, and don’t serve public safety goals. According to a 2015 Seattle University study, the average death penalty case in Washington costs taxpayers roughly $3 million—over $1 million more than when the death penalty is not pursued by local prosecutors. These estimates include trial and post-conviction incarceration costs. As for the public safety arguments, Satterberg held that the death penalty isn’t an effective deterrent to crime and that life-without-parole sentences are essentially “death sentences” because inmates with life sentence convictions die in prison. Ferguson said that 75 percent of death penalty cases in Washington state have been overturned since 1997. In 2014, Democratic Governor Jay Inslee placed a moratorium on capital punishment. A year later, The Washington Association of Prosecuting Attorneys endorsed putting capital punishment before voters. However, the issue has never been put on the ballot since. Those who testified included prosecutors from counties across the state, law enforcement officials, clergy, and families of victims of homicide who lined up on both sides of the issue. Snohomish County Prosecuting Attorney, Mark Roe, argued that while he personally believes that the death penalty is warranted for the most heinous of violent crimes, capital punishment should be put before voters because it is a moral issue. Family members of murder victims testified on both sides of the issue. Cecil Davis, who was convicted of killing Trapp’s mother, is still alive due to Gov. Inslee’s 2014 moratorium on capital punishment. Conversely, Teresa Mathis, whose brother was murdered in 1983, said she supports the repeal because of the financial resources required by local governments to prosecute death penalty cases. Members of the law enforcement community who testified at the hearing were unified in their opposition to the bill. Simpson said his daughter’s killer is currently in prison serving a 38-year sentence. Bishop Daniel Mueggenborg of the Seattle Archdiocese testified in favor of abolishing the death penalty. “Catholics believe that all human life is sacred, from conception to natural death … Just a few months ago Pope Francis condemned the death penalty,” he said. 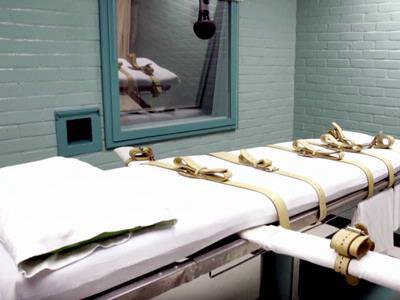 Elisabeth Smith with the American Civil Liberties Union said that the death penalty has “failed Washington.” “It is costly. It fails to provide swift and certain justice or deter crime, and it’s not applied fairly,” she said. Sen. Maureen Walsh, R–Walla Walla, the sponsor of Ferguson’s bill, spoke briefly as well. She emphasized financial costs of death penalty cases and cases where individuals were wrongly convicted as justifications for the bill. There are currently eight people on death row, according to the state Department of Corrections.